The region's combined authority will vote on plans for a clean air zone that include fines of £100 per day for lorries from 2021. Friends of the Earth said "all vehicle types" should be included and it is "dismayed" by the plans. Details revealed in a report on Tuesday show the "daily penalty payment" for driving a high-polluting bus or lorry would be £100, and for driving a high-polluting taxi would be £7.50 from 2021. The term "high-polluting" is defined as buses and HGVs built before 2013, diesel cars built before 2015, petrol cars built before 2005, and vans and mini buses built before 2016. 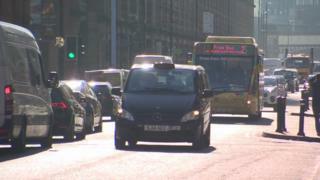 Mayor Andy Burnham said including private cars in the scheme "would be a disproportionate thing to do". "It wouldn't actually speed up the date of compliance enough to justify imposing a charge, often on some of our poorest residents", he said. But Green campaign group Friends of the Earth said clean air zones must "come into effect rapidly and must include all vehicle types". The group said in a statement it was "dismayed that Greater Manchester will not tackle illegal levels of air pollution before 2024".